Not all the excitement took place on the track at this year’s inaugural race in the NASCAR Sprint Cup Series. Opening weekend at the Daytona International Speedway also saw the introduction of the all-new 2014 Chevrolet SS sport sedan, which debuted alongside its striking racecar counterpart, and is available here at Jack Maxton Chevrolet in Worthington, Ohio. The new Chevrolet SS is the first high-performance rear-wheel drive sedan from Chevy since the 1996 Impala SS, and it’s also the new Chevy entry in the Sprint Cup Series. Packing the same awe-inspiring LS3 V8 as the 2013 Corvette, the road-going SS boasts the power performance enthusiasts crave while serving as a showcase of contemporary design, luxurious accommodation and innovative technology. The performance pedigree of the new 2014 Chevrolet SS (MSRP $43,475) is well established. In fact, the NASCAR and street-car versions of the SS share the same V8/rear-drive layout – the sole pairing to do so. The street-going versions of the Ford Taurus and Toyota Camry (the other competitors in the Sprint Cup Series) offer four- and six-cylinder engines only, and neither of those cars features full-time rear-wheel drive. Performance is just one component of the equation, however. With the SS, Chevrolet has designed a halo car so complete that when it appears in showrooms later this fall only two options will be available – a power sunroof and a full-size spare tire. The heart of the new SS, the aforementioned 6.2-liter all-aluminum V8, is good for 415 hp and 415 lb/ft of torque. Power pumps through a six-speed automatic transmission complete with TAPshift paddles mounted on the steering wheel. Thanks to an aggressive 3.27 final-drive ratio, the SS is expected to cover the sprint from zero-to 60 mph in about 5.0 seconds – on par with the $65,000 BMW 550i. David Leone, executive chief engineer for GM global programs, explained that the goal in designing the new SS was to “create a car that delivers incredible grip and handling balance while cornering, while still being comfortable.” To that end, the SS incorporates a fully independent suspension with stabilizer bars front and rear, electronic variable-assist power steering and staggered, 19-inch forged aluminum wheels wrapped in ultra-high-performance Bridgestone tires. Another key to the car’s handling prowess is the use of lightweight aluminum for the hood and rear deck lid, which helps to deliver a near perfect 50/50 weight balance front-to-rear. The result is lateral acceleration that reached 0.9 g on the skid pad. By comparison, the Taurus SHO managed just 0.86 g in a test conducted by Car and Driver magazine. A limited-slip rear differential provides even greater control at speed, as does StabiliTrak Electronic Stability Control with Traction Control. Superior stopping power is assured thanks to track-proven Brembo front brakes that feature two-piece, four-piston aluminum calipers and huge 14-inch ventilated rotors. Taking safety to new heights is a suite of driver-assistance technology led by Forward Collision Alert, a camera-based system that alerts the driver when a crash is imminent. The list also includes a Rear Vision Camera, Lane Departure Warning, Side Blind Zone Alert and Rear Cross Traffic Alert, which employs radar sensors and issues visual and audible warnings when it detects oncoming traffic during backing maneuvers. 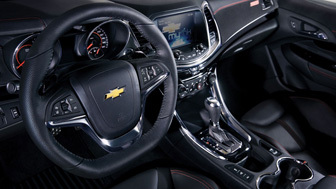 A first for any Chevrolet model, the SS also features Automatic Parking Assist. This system uses ultrasonic sensors to measure a parking space, then takes command of the steering to guide the car into the spot. All the driver needs to do is operate the throttle and brake pedals. Sporting a hunkered stance, a “power bulge” hood, a wind-cheating wedge shape and bright dual-exhaust tips, the new SS exudes its promise of exhilaration at speed even when parked. Premium design cues such as jewel-like chrome accents, High-Intensity Discharge (HID) headlamps and light-emitting diode (LED) daytime running lights add elegance to the athletic appearance. Inside the SS delivers an extraordinary degree of sophistication, boasting leather trim, cross-stitched cut-and-sew materials, satin-gloss and bright-chrome finishes, ice-blue ambient lighting, eight-way power front seats and the “SS” emblem stitched onto the soft-touch instrument panel. You can also expect such highlights as a nine-speaker Bose stereo, a full-color head-up display, a seven-inch touch-screen and the Chevrolet MyLink infotainment system – winner of the “Best of CES” award in the car category at the 2013 Consumer Electronics Show. Chevrolet likes to call the all-new 2014 SS sedan “the perfect mix of refinement, performance and technology.” Come in and experience the sophisticated new Chevrolet SS when it arrives later this year. Regular oil and filter changes are among the most affordable, and at the same time most important, scheduled maintenance services you can do to keep your vehicle running reliably for many years. Without proper lubrication, the combustion engine becomes little more than an expensive boat anchor. If oil isn’t changed according the vehicle’s maintenance schedule, it will get thicker and turn into a sludge that can’t do the intended job. 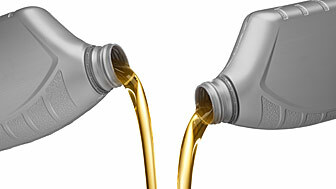 The oil filter, which helps to remove dirt and other particles from the oil, will also get filled up over time. When that happens, the pressure increases and a bypass valve opens that lets unfiltered oil run through the engine. If this happens for an extended period, it can cause very expensive damage. Until about the mid-1990s, it was generally recommended that drivers get their oil and filter changed every three months or 3,000 miles. Since then, a number of technological improvements have allowed oil change intervals to be extended to 10,000 miles or more, depending on the make, model and powertrain of vehicle. Driving style, frequency of towing, and weather and road conditions also play a big role in how often the engine oil in your vehicle should be changed, so you should check your owner’s manual for guidance. Your dealer’s service technicians are also a great resource for recommendations that are personalized for your particular vehicle and driving conditions. Oil formulations have improved, making oil more stable so that the thickness, or viscosity, doesn’t change as much over time, and detergents added to oil help break down contamination from fuel and exhaust. New fully synthetic and synthetic blends reduce engine friction and improve fuel economy while lasting longer. Modern engine electronics also help to extend oil life. Most new engines have sensors that can detect the condition of the oil, and systems built into the electronic control unit monitor driving conditions. By keeping track of conditions like temperature, average speeds and engine loads, oil life monitors can determine if your vehicle is subjected to conditions that can accelerate oil break-down––like frequent or heavy towing; extreme heat; lots of stop-and-go driving––or if most of your driving is highway cruising. Vehicles equipped with oil life monitors provide an indication of oil condition in the instrument cluster and recommend when to get an oil change. Vehicles that are subjected to more stress might be recommended for an oil change every 3,000 to 5,000 miles, while those that see lighter duties might go a little more, saving money and time for the driver. Speaking of saving time and money, while it’s not difficult to change oil yourself at home, the hassle of cleanup and properly disposing of the old oil (never dump it on the ground or in a sewer) can be avoided by having your oil changed by your dealer. As part of your dealer’s oil and oil filter change service, service technicians will also lubricate key chassis components, top off fluids as necessary, inspect other vehicle systems and discuss with you any problems or questions you may have. In most industries, consumers who have questions or problems must first search for the correct phone number, wait through extensive pre-recorded menu options and then hope that the person who eventually picks up has answers or can transfer the call to someone else who does. The new GM Customer Engagement Centers will use the opposite approach, anticipating the customer’s needs and seeking them out before they are forced to endure this lengthy call center process. GM will extend this support through a variety of mediums in order to help its customers most effectively. “This includes our social media team interacting on Facebook, Twitter and popular vehicle forums to offer assistance,” said Boler-Davis. This engagement procedure will achieve more than just answering the immediate questions of customers. “At the same time, GM is implementing processes and tools to enable the channeling of data from the centers to its designers and engineers to capture the voice of the customer for further improvements in vehicle programs,” states a GM press release. 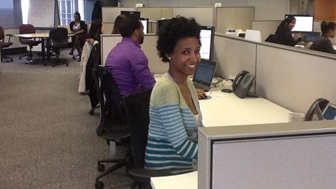 The lifeblood of these new centers is the advisors who are expertly trained to anticipate and meet customer’s needs. One way they will achieve this is by connecting with new vehicle owners who may need extra support or have issues for which they have not yet sought assistance. These advisors are cable of instantly solving many problems because they are empowered by GM to make many decisions on the spot. The GM Technical Center in Warren, Michigan will receive approximately 300 of these advisors from the consolidation of several other GM operations. This relocation places advisors in close proximity to other GM employees who will be available to assist advisors by answering questions and providing rapid decisions, when needed, to address any customer concerns that advisors could not resolve. GM is not only transforming the way that big businesses and customers engage with each other through these centers, they are embracing a wide range of technology to engage with customers in the forums they use most. This will be achieved with a subset of social media advisors, who will work at GM’s Global Headquarters in Detroit. These Customer Engagement Centers are a sign that GM is rapidly meeting its goal, “to provide the best customer experience in the industry,” as stated in its press release. With the kids home from school for the summer, many families decide to pack up the family vehicle and hit the open road to visit family or see America. Being confined to an enclosed space can be stressful enough, so basic preparations before the trip can help keep unexpected disasters to a minimum. First up is checking the condition of all the tires. With gas prices of nearly $4 per gallon, an easy way to save at the pump is to make sure the tires are properly inflated. Check the sticker on the driver’s door jamb for the recommended pressures, and make sure all four tires are up to spec. Before a road trip, it’s equally important to check the pressure in the spare. While you’re at it, do a visual inspection of the tires and replace tires showing excessive or uneven wear. Compact spares are typically inflated to between 80 and 90 psi, compared to about 30 to 35 psi for conventional tires. While checking the spare, don’t forget to take out the jack and make sure it’s working and all the parts are there. If your wheels have locking lug nuts, you wouldn’t want to get stranded with a flat tire that can’t be removed so make sure the key is in the car, as well. A first aid kit in the vehicle is always a good idea, too. Cranky kids confined to a steamy car on a hot summer day are not conducive to a fun family outing, so if you haven’t already checked out the air conditioning, make sure it’s properly chilling the cabin air. If necessary get it recharged with refrigerant or get other repairs done. Of course, the passengers aren’t alone in needing cooling in the summer. Make sure the engine coolant reservoir is filled to the proper level and the coolant is in good condition. It should be either a bright green color or bright orange if it uses Dex-Cool coolant. If there are any signs of brown discoloration, have the system inspected by your dealer’s service department, as it could be an indication of a leaking head gasket that’s allowing oil to mix with the coolant. Don’t forget to check under the vehicle after it has been parked to make sure there are no leaks. If there are signs of any fluids other than water (which may just be condensation from the air conditioning compressor) get it checked and repaired as soon as possible. If you are planning a long trip and your car is close to the mileage where it needs an oil change, take it in early to get fresh oil. No matter how much you prepare for a trip, the unexpected can sometimes happen. Thankfully, roadside assistance services are always ready to come to your aid. Many automakers now offer complimentary roadside assistance that includes towing, tire changes, emergency fuel delivery and other services during the warranty period on new and sometimes pre-owned vehicles. Cell phone providers also frequently offer similar assistance services for just a few dollars per month added to your bill. For those that prefer the traditional approach, automobile clubs like AAA are also a great option. No matter what service you opt for, make sure you know your account number and program the phone number into your cell phone. Speaking of cell phones, remember to bring a 12-volt charging adapter so you can keep the battery charged while driving. If you are planning to use a smartphone as a navigation device, check out your local cell phone store for a windshield mount for the phone so you don’t have to hold it in your hand. Thanks to modern consumer electronics, kids can also stay entertained on the road––listening to whatever music they like, or using laptops or tablets to play games or watch movies––without annoying parents. The batteries in those devices have a habit of running down at inopportune times, however, so having suitable charging capabilities is important. For devices that can charge from USB ports, if the car doesn’t have extra ports, get a couple of extra 12-volt to USB chargers and, if needed, a multi-outlet adapter. If using a laptop on the road, investing in a 400-watt power inverter will provide one or two AC outlets just like at home, so everyone can stay occupied. Stop by the dealership today and let us make sure your car is in the right shape before you take it out on a long road trip. Some basic preparation will help minimize the chances of avoidable disasters on the road and allow everyone to come home with memories of a great trip.